It was a struggle leaving Langar. After a night in a bed (=mattress on floor), I was more tired than usual. Not much energy either (soup and bread for dinner is not enough calories for a cycle-tourer, even after you wake in the night and eat a Snickers bar). So I lingered over breakfast and finally got underway mid-morning when the sun was well up. 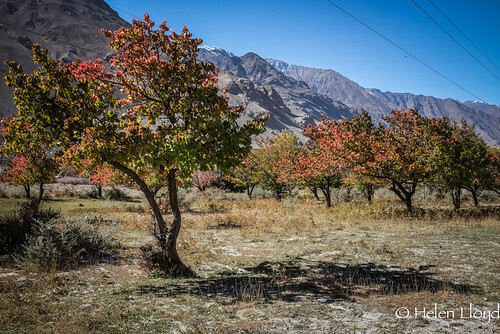 Still the leaves glowed gold and the snow-capped peaks on the Afghan side of the river sparkled. 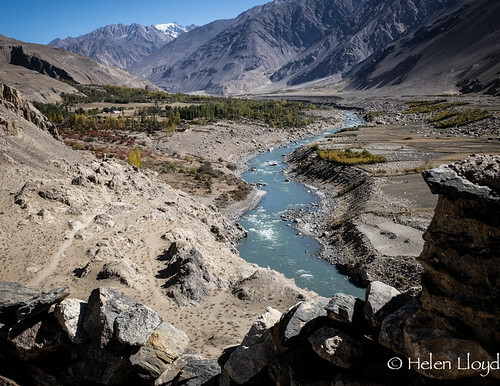 The road through the Wakhan valley closely followed the river that snaked through the wide valley, languidly rolling blue and turquoise and rippling over rocks and glittering in the sunlight. 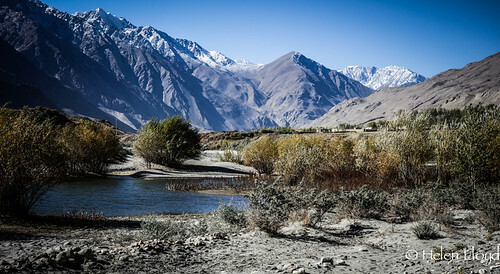 Sand dunes and dry scrub beneath the rugged beauty of the great grey-faced mountains was a contrast like fire and ice. The cycling was easy. Paved roads through the villages and gravel between until nearer Ishkashim on the great bend in the river where the wind whipped up the dust and blew in my eyes where most the road was tarmac with just a few potholes. Beyond the bend and the grey and gravel, the rocks rose red and the plants were more thistly and thorny. Lower now, it was warm through the night and with clear skies still I camped before Khorog in my bivi. No need for the tent. Uneventful riding, easy and pain-free, I had plenty of time to stare at the scenery and wonder. Only a snapped bike chain gave me any real dirt and distraction, but that was easily fixed. 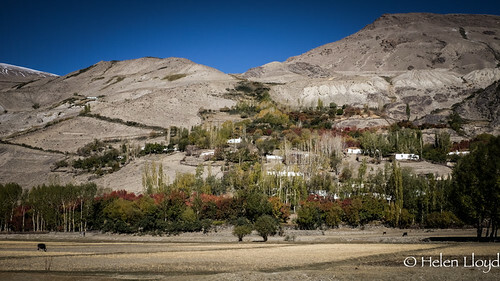 So I made it to Khorog, two weeks after leaving Osh. And here there were plenty of well-stocked shopped and a good place to eat close to the guesthouse that served beer too. So I was happy! Thanks Johann, glad you liked!